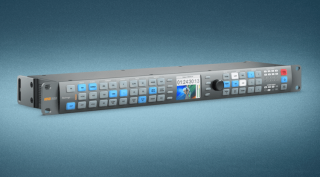 The What: Blackmagic Design has announced Teranex AV, a new broadcast quality standards converter designed specifically for AV professionals. Teranex AV features 12G-SDI and HDMI 2.0a inputs, outputs, and loop-through, along with AV specific features such as low latency, a still store, freeze frame, and HiFi audio inputs for professionals working on live, staged presentations and conferences. Teranex AV will be available in September for $1,695 from Blackmagic Design resellers worldwide. The What Else: The new Teranex AV features low latency that’s as low as 67 milliseconds, which means that customers can convert any HDMI or SDI video format instantaneously to a different format and output it for projection in sync with the live event. For example, customers using Teranex AV at a concert can project a close up of a virtuoso pianist as their fingers fly across the keys on a big screen projector in synchronization with the live performance. In addition, customers get advanced HDMI 2.0a processing with input, loop-through, and output connections. This lets customers convert HDMI to SDI without any additional hardware. They can loop the HDMI signal out to a big screen projector while simultaneously converting it and and sending it to downstream equipment like decks and monitors. For audio, Teranex AV also features two channel consumer HiFi connections, as well as XLR connections for four channels of AES/EBU or two channels of balanced analog audio. The consumer HiFi connections are critical for professional AV customers because they allow lapel microphones, laptop computers, and other devices with consumer audio connections to be used with Teranex AV. Now customers can connect virtually any audio source to Teranex AV and use it to embed the audio with the video and output the signal in any format. The Bottom Line: In addition to HDMI and 12G-SDI connections, Teranex AV also includes quad link 3G-SDI outputs, making it compatible with a wide range of older Ultra HD monitors and projectors that only support quad link SDI 1080 HD inputs. This also makes Teranex AV a great video wall processor because it can split Ultra HD into 4 HD screens, or it can scale regular HD up, split it and output it onto 4 large screens for a tiled video wall.